It’s been several months since the crisis of capitalism was unleashed on the international level, with its epicenter in financial capital and the US economy. Now we have more evidence that this crisis will be profound and prolonged, affecting all the peripheral economies — including Brazil. Many analyses of the crisis have been published in academia and the media. There are all sorts of positions and ideological currents. But they all converge on this diagnosis: it is a profound crisis, worse than the crisis of 1929. It will affect the entire world economy, which has been increasingly internationalized and controlled by fewer than 500 companies. It will be worse, because it combines an economic crisis, a financial crisis (of the credibility of currencies), an environmental crisis, an ideological crisis due to the failure of neoliberalism, and a political crisis due to the lack of alternatives on the part of the dominant class at the center of capitalism or the governments of the periphery. In the history of crises of capitalism, the dominant classes, owners of capital, and their governments have adopted the same prescription to exit them. First, they need to destroy a part of (over-accumulated) capital (lacking demand) to make room for another process of accumulation. In recent months, over 4 trillion dollars in paper money have gone up in smoke. Second, they call for wars. War is a way of destroying goods (weapons, munitions, materials, facilities) and getting rid of the social tension of workers. And it does so in such a way as to also eliminate the industrial reserve army. Thence the First and Second World Wars, and then the Cold War. Now, given the fear of atomic bombs, they stir up regional conflicts instead. The attacks on the Palestinian people by Israel, the provocations in India, and the threats against Iran all fit in this strategy as well. The strategy is to increase military spending and destroy goods. Third, magnify the exploitation of workers. That is to say, in crises, lower the average wages, and bring down the living standards and thus the costs of the reproduction of the labor force, in order to restore the rates of surplus value and restart accumulation. Hence also the expansion of unemployment, which keeps multitudes surviving only on the basic baskets of goods, etc. Fourth, a greater transfer of capital from the periphery to the center of the system. This is accomplished by the direct transfer from enterprises in the periphery to their headquarters, as well as through the manipulation of the dollar exchange rate, the payment of interests, and the manipulation of prices of goods sold and bought in the periphery. Fifth, capital goes back to using the state as the manager of the savings of the population to shift these funds for the benefit of capital. For this purpose, capitalists again valorize the state, not as the caretaker of the interests of society, but as the steward of their interests, to use its compulsory powers and thus collect money from everyone, through taxes as well as savings deposited in the banks, in order to finance their way out of the crisis. We are witnessing the application of these classic measures, reported in the press every day — here in Brazil, in the center of capitalism, and in the rest of the world. But, as with everything in life, there are always contradictions. For each action of capital, the government, etc., there will be its contradiction, which society and workers can recognize and exploit to change the situation. The historic periods of crises are also periods of change. For better or worse, there will be changes! Crises create openings and rearrange the positioning of classes in society. In Brazil, we are still apathetic, amorphous, listless, watching the description of symptoms of the approaching crisis on television. There was hardly any reaction or feedback from nearly 800,000 workers who lost their jobs just in December 2008. Nor are there comments on the IPEA research showing that, of the 17 million poor families in Brazil in the general register of beneficiaries of government programs, 79% of them are unemployed! For they received some benefits, they are not seeking more jobs, and they are left out of even the statistics of unemployment. It is vital for the organized sectors of society — in all existing forms, whether in churches, trade unions, schools, colleges, universities, the press, social movements, or parties — to do something about the crisis. The first thing to do is to debate the nature of the crisis and find ways out of the crisis, from the point of view of workers and the majority of society. It is urgent to encourage all manner of discussions in all arenas. Paraná Educational TV’s initiative to promote this kind of public debate is welcome. But it is still insufficient. The crisis will be long and deep. We need to involve the largest possible number of militants, politically conscious men and women, to discuss the situation, so we can collectively build popular alternatives. Without mobilization and social struggles, there will be no way out for the people — except for capital. 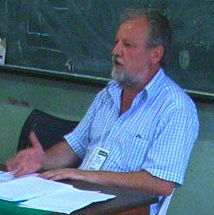 João Pedro Stedile is a member of the national coordination of the MST and Via Campesina. The original article “A crise será profunda e prolongada. . .” appeared in the February 2009 issue of Caros Amigos, Sao Paulo, Brasil, republished by the Agencia Latinoamericana de Información on 16 February 2009.